SAN JOSE, Calif. – Trailing 10-6, the University of Utah football team reeled off 28 straight points on the way to a 34-17 victory over San Jose State in its road opener and non-conference finale Saturday night at CEFCU Stadium. Utah (3-0) was able to make big plays throughout the night as the Ute defense had 10 sacks, which tied for the second-most in school history. Utah’s offense mustered five plays over 25 yards (three passing, two rushing) and the Utes were opportunistic with 17 points off three SJSU turnovers. The Utes improved to 20-1 in non-conference contests since joining the Pac-12 Conference in 2011 and are off to their third consecutive 3-0 start. Junior quarterback Troy Williams completed 71.4% of his passes (20-of-28) for 257 yards and one touchdown (1 INT). True freshman quarterback Tyler Huntley appeared in his second game this season and completed 1-of-2 pass attempts. A trio of Utah running backs combined for 248 yards on 31 carries (8.0 ypc) with each running for a touchdown. True freshman Zack Moss made his first career start and rushed for a team-high 95 yards on 12 attempts (7.9 ypc), including a 10-yard touchdown run. Moss also turned in a 51-yard rush. Sophomore Armand Shyne was second on the team with 92 rushing yard on 12 carries (7.7 ypc), including a nine-yard touchdown run. His long run of the night was 17 yards. Junior Troy McCormick had 61 yards on seven attempts (8.7 ypc), including a long run of 31 yards. He also scored his second rushing touchdown of the season with a 16-yard TD run in the second quarter. He also had three receptions for 18 yards (long of 11). Senior wide receiver Tim Patrick recorded a career-high 121 receiving yards on six catches for his second 100-yard receiving game of the season. He also caught his fourth TD of the season, a 4-yard score in the second quarter. SJSU went 64 yards on 10 plays during the initial drive of the contest that resulted in a 29-yard field goal by Bryce Crawford, the first time Utah trailed this season. Utah countered with six consecutive points to grab a 6-3 lead after the first quarter. Williams found Butler-Byrd for a 45-yard pickup along the Ute sideline to spark a six-play, 56-yard drive that resulted in a 37-yard field goal by Phillips. The Utes were forced to punt on their next possession, but Wishnowsky’s 59-yard effort was dropped by SJSU’s Tim Crawley, which set up the Utah offense on the SJSU 26-yard line. Casey Hughes put the pressure on Crawley to force the fumble. The drive resulted in a Phillips’ 23-yard field goal to give the visitors a 6-3 edge. SJSU regained a 10-6 lead for a brief moment after its next possession, but Utah would score the next 28 points of the contest. To start Utah’s next drive, Moss broke off a 51-yard to spark Utah’s next drive. McCormick zipped into the end zone two plays later for a 16-yard touchdown to give the Utah a 13-10 lead. Utah’s four-play scoring drive went 75 yards, with all yardage coming on the ground. 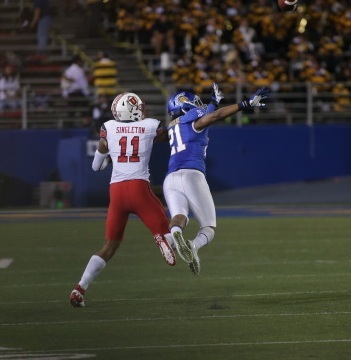 Utah turned in back-to-back three-and-outs for SJSU and Porter dragged a foot down in bounds for an interception to stop the Spartans for a third straight occasion. Williams dropped back and found Patrick on a post route for 53 yards on Utah’s last drive of the first half, which was Utah’s fourth play of at least 50 yards this season. Redshirt freshman wide receiver Siaosi Wilson drew a holding penalty in the end zone before Williams found Patrick on a slant route four a 4-yard touchdown, his fourth TD catch of the season, to give the Utes a 20-10 halftime lead. The Utes’ next possession saw them go 68 yards on five plays in 1:20 to build a 28-10 advantage. Williams lofted a pass to Patrick down the far sideline for 28 yards and Butler-Byrd picked up an additional eight yards on the next snap. 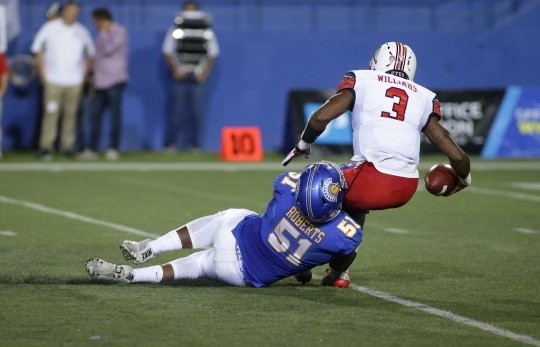 Moss rushed for three yards then Williams connected with Singleton for a 19-yard reception to move the Utes to the SJSU 10-yard line. From there, Moss found a crease and accelerated into the end zone for a 10-yard touchdown rush, the first of his career. Marcus Williams halted SJSU’s first drive of the fourth quarter with his second interception of the season (eighth career). When Utah took possession, the Utes drove 38 yards on five plays for a touchdown to jump to a 34-10 advantage. Four of the five plays were runs, which was capitalized by a 9-yard touchdown run by Shyne, the first of his career. 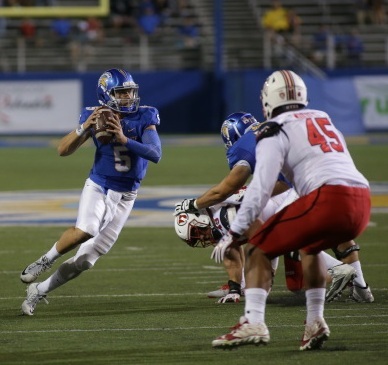 SJSU scored a touchdown with 3:45 left in regulation to set the final margin at 34-17 in favor of Utah. The Utes start Pac-12 Conference play against USC on Friday. Kickoff from Rice-Eccles Stadium is set for 7 p.m. MDT with live television coverage on FS1.